At Miami Valley Smiles, we’re on a mission to keep our friends, families, neighbors, and community members happy and healthy – and smiling! Most people don’t realize just how important oral health is, not just for preventing cavities and gum disease, but for the health of your entire body. The mouth is a microenvironment that mimics the health of your body, and a direct pathway for bacteria and infections to travel through your gums into your bloodstream, to flow throughout your body and into your main lifelines. Keep your defense strong by brushing, flossing, and seeing your Mason dentist regularly. Oral hygiene is one of your best lines of defense against not only tooth decay and gum disease, but also against the serious health complications that can follow. We all know we should brush twice daily and floss every day, but few of us actually maintain this regimen, and even fewer of us do it effectively. Thankfully, our outstanding hygiene team at Miami Valley Smiles has your back. We will provide you with the knowledge, the techniques, and the tools to keep your smile clean and healthy between visits and give you a gentle yet thorough cleaning twice a year to take care of any plaque or tartar you’ve left behind. Invest in an electric toothbrush, they really do clean better than a manual and with less effort. We would be happy to recommend one for you! Brush at least twice per day for two minutes. Hold the brush at a 45-degree angle so the bristles get along and under the gum line, and brush in small circular motions. Be sure to brush all sides of your teeth and all the way to the back. Don’t forget to brush the tongue or use a tongue scraper, as the tongue can harbor lots of bacteria that will only get redeposited after you’re done brushing, which kind of defeats the purpose. Floss daily. Curve the floss in a c-shape around each tooth and under the gum line. Release a new section of floss for each tooth to avoid redepositing bacteria and plaque. If traditional string floss doesn’t work for you, there are plenty of alternatives available. We would be happy to recommend one that will fit your needs. Rinse with mouthwash to kill bacteria in the rest of the mouth, creating a healthier environment. Swish with water after eating or drinking, before brushing, and throughout the day to minimize plaque buildup, acidity, and bacteria. Be sure to spit not swallow. Avoid brushing right after eating or drinking, as the acid produced combined with the brushing motion can easily damage your enamel. Instead, swish with water after, wait about 30 minutes and then brush. Gum disease is the leading cause of tooth loss for adults, and left untreated can contribute to the development of at least 52 serious systemic diseases including heart disease, stroke, diabetes, and Alzheimer’s. If your gums are bleeding during regular brushing or flossing, we’re sorry to tell you, you have early-stage gum disease known as gingivitis. The good news is, gum disease is preventable, treatable, and reversible. Treatment for gum disease varies on a case-by-case basis depending on the level of infection and tissue damage. If you only have gingivitis, we can likely reverse the disease with some simple improvements to your oral hygiene routine. We may perform deep cleanings on a more regular basis, including a technique called scaling and root planing. This is essentially cleaning below the gum line, removing tartar buildup and creating a healthier environment for the gums to reattach to. One of the primary symptoms of gum disease is gum recession, although gum recession can happen for other reasons including brushing too hard or ill-fitting dental appliances. When the gums recede far enough, they leave your teeth and tooth roots exposed and more susceptible to tooth decay and infection. When enough gum tissue is lost, the gums are no longer able to support the teeth resulting in tooth loss. At Miami Valley Smiles, we want to protect your teeth and rejuvenate your gums for a healthier environment and a more aesthetically pleasing smile. 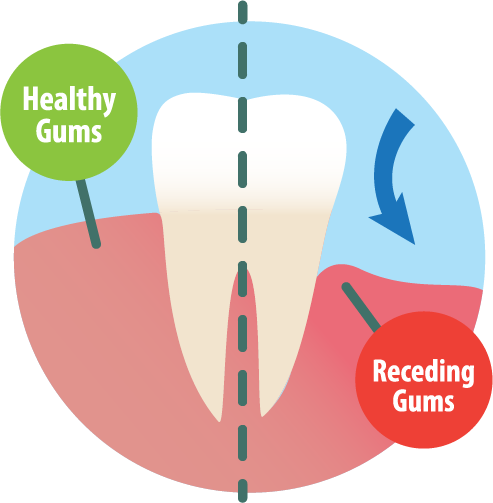 Gum recession treatment typically involves scaling and root planing to promote reattachment of the gums to the teeth. We can also perform gum surgery or a gum graft to supplement tissue that has been lost. Gum grafting typically involves taking a small amount of tissue from the roof of the mouth and attaching it to the gums where the recession has occurred to cover the exposed tooth roots and save your teeth. 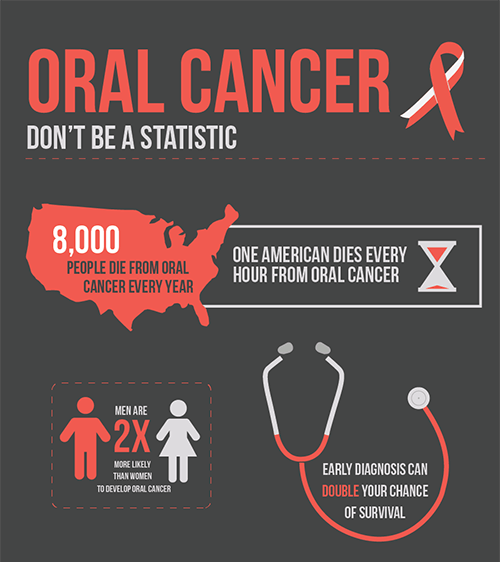 Oral cancer is one of the deadliest forms of cancer because it is typically not detected and diagnosed until late-stage when it’s too late. This is one of the many reasons it’s important to see your Miami Valley dentist regularly for cleanings and exams. While tobacco and alcohol are still considered major risk factors for oral cancer, new research tells us there’s another risk factor that outweighs those two combined – HPV. In an age where most sexually active adults will contract the infection at some point in their life (79 million Americans are currently infected), many of whom never even realize they are infected, it’s more important than ever to be screened regularly for oral cancer. At Miami Valley Smiles, we believe your healthy smile is your greatest asset. If you or your little one play any type of contact sports, or if you suffer from teeth grinding or TMJ, we highly recommend a custom mouthguard to protect your teeth and jaw. Yes, there are stock mouthguards you can find at our local sporting goods store, but they are not properly fitted to your mouth so they don’t fit well, are not comfortable, and are much less likely to be worn. Only a custom mouthguard provides the best fit, highest comfort, and the most protection against oral injuries, tooth loss, and can even minimize damage from concussions. If you have any questions about general dentistry or would like to schedule an appointment with your Mason dentist, Dr. Lance at Miami Valley Smiles, give us a call today at (513) 445-4064 or request an appointment online below! We look forward to smiling with you.